In 2011, the old bridge accross Lake Champlain connecting Crown Point, NY. and Addison, VT., was replaced by a new Modified Network Tied Arch concept bridge. 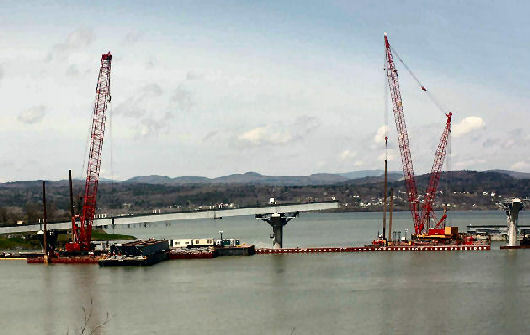 During the construction of the new bridge and its support columns, various cargo barges and numerous sectional barges were used with mobile cranes, manlifts, and concrete pump trucks on deck. Argonautics Marine Engineering, Inc. was hired to provide all naval architectural calculations associatded with working with these barges. Also a peer review of the procedures for float-in installation of the span was provided. The bridge opened on November 7, 2011 to the public. Photographs courtesy of Flatiron Contructors. Peer review of the span float-in procedures, using 2 barges.